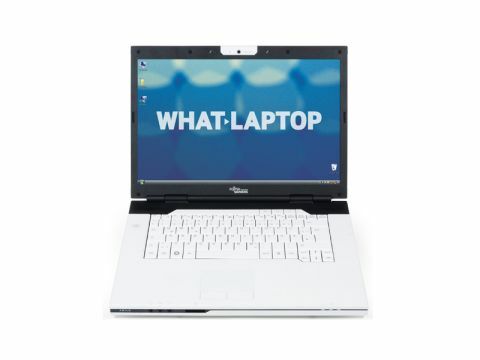 The Fujitsu Siemens Amilo Pa 3553 (£699 inc. VAT) is a semi-portable laptop aimed at the consumer market. It's the ﬁrst machine we've seen to feature AMD's latest M780G platform, which brings with it a host of new processors and updated graphics options. The Amilo is unique among many of the competition, as it features two graphics cards. In addition to the integrated ATi Radeon 3200 chip, AMD's Hybrid CrossFireX technology allows a dedicated ATi Mobility Radeon HD 3470 GPU to work in tandem, offering a theoretical performance boost over rivals. We found enough power to play mid-level games or run multimedia applications, but performance wasn't noticeably better than the Asus F7Se or Dell Studio 1535, which both feature a single ATi Mobility Radeon HD GPU. The 15.4-inch screen is one of the Amilo's best features, proving bright and with vivid colours. Movie playback is impressive, and it's great for editing photographs. Reﬂections and ﬁngerprints are highlighted in direct sunlight, however, as with all Super-TFT panels. The Pa 3553 has a pleasing design. The tidy chassis is ﬁnished in white plastics, with contrasting black highlights. The bottom of the machine is also white, making it reminiscent of Apple's MacBook. Build quality isn't so impressive, however. The large keyboard is comfortable and responsive to type on, but the board ﬂexed under the slightest pressure. The chassis felt sturdy to the touch, but the palm rests heated up quickly and remained hot, even with the air vents unobstructed and the laptop used on a cool, hard surface. Processing power comes from AMD's Turion X2 Ultra X2 ZM-80 processor. We found performance similar to other mid-level Intel-based machines, with lag only starting to appear when we were using several intensive programs. Battery life was considerably less than its rivals, however, with the FSC failing to last for 100 minutes between charges. The FSC features a Blu-ray drive, letting you play high-deﬁnition (HD) content. The screen isn't sharp enough to let you get the most out of HD movies, but an HDMI interface means you'll be able to output ﬁ lms to an HDTV. A VGA-out port is also provided, supporting analogue signals and letting you connect to older displays or a projector.